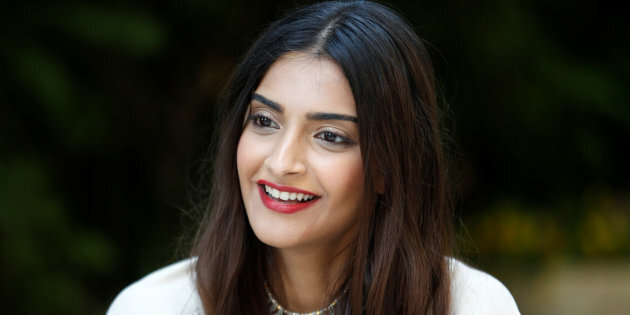 Sonam Kapoor the fashionista of Bollywood industry, is pretty vocal about her feelings and never hesitate to reveal the same. She never shies from her opinion and this time it is Donald Trump who was the scapegoat for the actress. 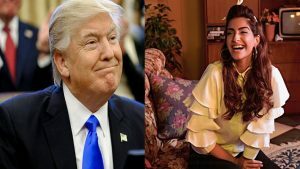 Sonam Kapoor doesn’t have the fondness towards Donald Trump and we knew it when she called him a Joker. It all started when Ellen Degeneres posted on her twitter that President Trump is allowing elephant hunters into America and called out everyone to spread the message as much as possible. That’s when Sonam Kapoor called Trump an imbecile for killing poor elephants. Sonam Kapoor is currently working on Veere Di Wedding which is being produced by her sister Rhea Kapoor Ekta Kapoor and Nikhil Dwivedi. The film is being directed by Shashanka Ghosh. The cast also includes Kareena Kapoor, Swara Bhaskar, Shikha Talsania who go to a wedding and find their true love. The film will be released on 1st of June 2018. She is also acting in Sanjay Dutt biopic along with Ranbir Kapoor, who is playing the role of Sanjay Dutt. She is acting as a love interest of Sanjay Dutt i.e, Ranbir Kapoor. The movie is being directed and produced by Rajkumar Hirani. The Star cast of the film also includes Anushka Sharma and Dia Mirza. She is also acting in Battle of Bittora it is again being directed by Shashanka Ghosh. The film is being produced by Farhan Akhtar. Fawad Khan was selected to be the male lead but then he got replaced by Farhan Akhtar. The release date is not yet finalized for the film. She is also acting in the film “Ek Ladki Ko Dekha To Aisa Laga” starring Anil Kapoor Rajkummar Rao and Juhi Chawla. This movie is done directorial debut of Shelly Chopra Dhar and is being produced by Fox Studios.